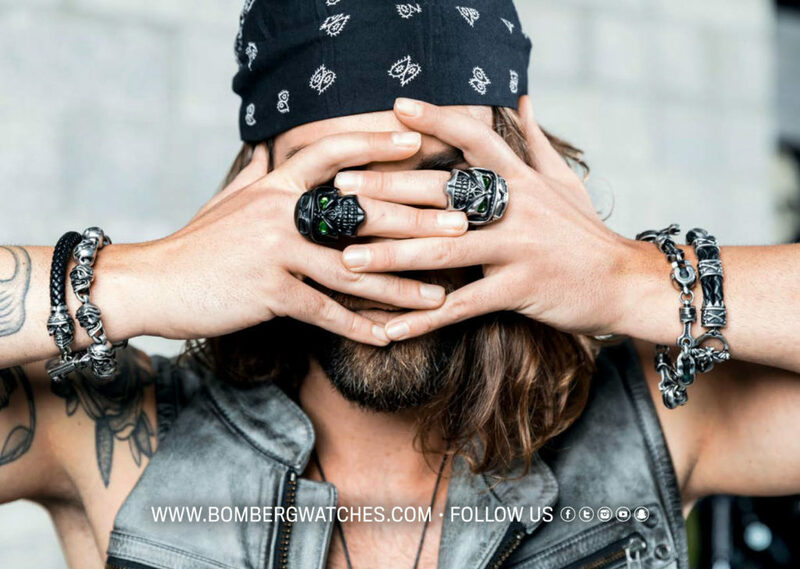 For Baselworld 2017, Rick De La Croix‘s BOMBERG is proud to announce its newest collaboration within the BOMBERG family: The exceptional jewellery designer Cory Brindson is as daring and bold as BOMBERG itself and has created the newest skully rider bracelets, rings, new cufflinks, Pendant and a fresh key chain for the Swiss watch and accessories brand. The collection is bold, fresh and very daring – several bracelets, ring, novelty, pendant cufflinks and the newly developed key chain will make any look rebellious and the new jewelry collection will draw the attention wherever one goes. 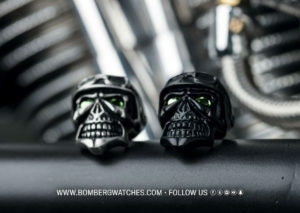 The “Skully Rider” extended jewellery collection contains four different bracelets: – The “Skully Rider Steel I” – this model alternates skully rider heads and screw wrenches in a daring way. Both paterns are made of brushed steel PVD. This model is available in three different sizes – small, medium, large – The “Skully Rider Steel II” – this bracelet symbolizes the essence of the collection with a successive representation of skully rider heads in brushed steel PVD. This edition is also featured the sizes mentioned above. – As well as the “Skully Rider Black”, made of brushed steel PVD in all black and high quality breaded leather straps. The Skully Rider Leather and Steel is a perfect mix between two materials which express perfectly the spirit of BOMBERG. The Skully Rider Rings, Cufflinks, Pendant & Key Chain The innovative Skull Rider Ring comes with the eyes crafted of small Swarovski © Stones and come in green, crystals – a truly exclusive “eye catcher”. The cufflinks and key chains are also crafted with brushed steel as well as the Pendant. 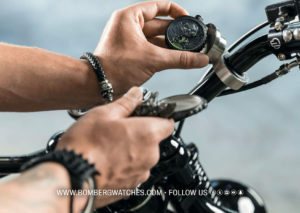 Cory Brindson is the man behind the Chris Black Designs and BOMBERG’s new, daring Skull Rider jewelry collection – a brand focused on tradition and details, just as the Swiss watch and jewelry house. While Brindson lives in Australia, he was originally born in New Zealand. And this is where he draws all his inspirations. The indigenous Maori tribe is known for their exceptional artistic skill like tattooing or hand carving. This craft inspired Cory and has instilled within him a respect for the nearly lost art of hand crafting jewelry. This is why his pieces are mold and crafted solely by hand, which allows him to add character to each and every piece he makes. Cory enjoys creating skull jewelry more than any other design theme. Thus, him and Chris Black Designs offer a true individual and custom handmade craftsmanship and Cory loves spending hours creating the individual pieces. 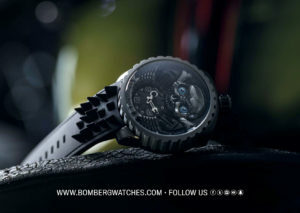 Rick De La Croix first opened Bomberg’s doors in 2012 and since then stands out in the watchmaking & jewelry industry. Thanks to their innovative, bold designs, they have revolutionized the current market and by breaking the rules they bring freshness to the industry. So, it can only be expected that this new partnership will be exactly as daring and unconventional as the Swiss watch and jewelry brand itself.